In the aftermath of the Great Recession, governments have implemented several policy measures to counteract the collapse of the financial sector and the downswing of the real economy. Within a framework of Minsky-Veblen cycles, where relative consumption concerns, a debt-led growth regime and financial sector confidence constitute the main causes of economic fluctuations, we use computer simulations to assess the effectiveness of such measures. 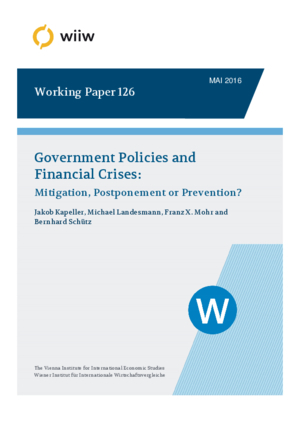 We find that the considered policy measures help to mitigate the impact of financial crises, though they do so at the cost of shortening the time between the initial financial crisis and the next. This result is due to an increase in solvency and confidence induced by the policy measures under study, which contribute to an increase in private credit and, thereby, increase effective demand. Our results suggest that without a strengthening of financial regulation any policy intervention remains incomplete.